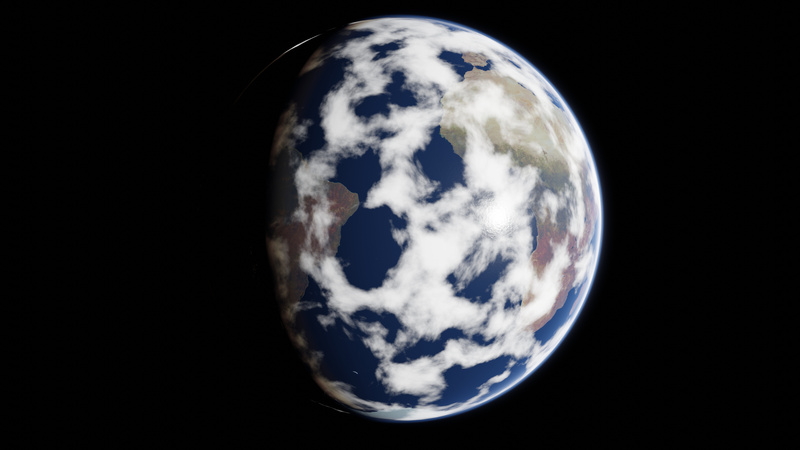 Since I had enought of the rendertimes of volumetric atmospheres, I tried to create my own Evee compatible Earth Atmosphere. I began by Rendering out a reference image of a volumetric atmosphere to get everything just right. Then I started setting up the shader. The basis for the reylight scattering is a diffuse shader converted to rgb. The rest is just different fresnels with different values and different Colors. 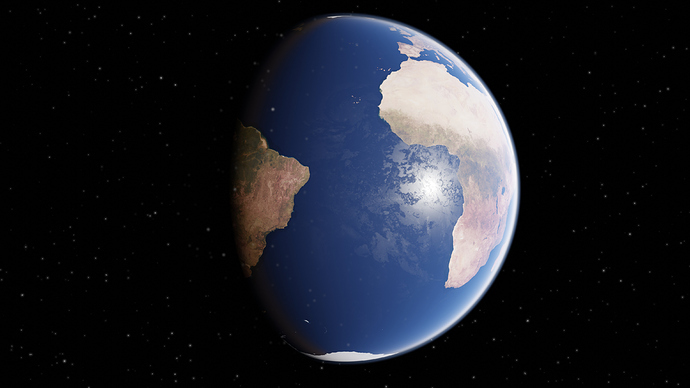 I used 2 different spheres for the atmosphere to achive the white edge fading into the blue edge. After that, I blurred them both a bit in the compositor and added some glare. I also have clouds, but they seem to only be shown if I have show backface enabled and I can´t do that because it leads to weird artifacts on the night side at the pole region. There are some mistakes in it, mainly the stars being affected by the glare in the compositor and the stars showing on the earth. That happened because I didn´t find how to use the object index in the compositor of Blender 2.8. I don´t really know where to go with this, but I will probably turn this into an animation of some sort, maybe even with nightlights. Please give any Feedback or tips. Yeah, I know that tutorial. The Problem is, that its in 2.7 and the atmosphere is much more simple. Andrew didn´t implement reylight scattering in this model, and he used the object index to Isolate the atmosphere, which I don´t know how use in 2.8. Your cloud object must be inverted then, Try to flip the normals. Another thing, the stars should not appear in front of the planet. Yeah this was a texture I grabbed from Videocopilot which had a very weird roughness map. I fixed that up a bit and I managed to solve the star Problem and the Cloud Problem. Clouds are not final yet, they are just a simple noise texture with Maximum Detail and a Color ramp. You might want to go through my tutorials. You need an atmosphere, and I’ve got textures to download for that and cloud cover. I will take a look at it. Do you have a link?